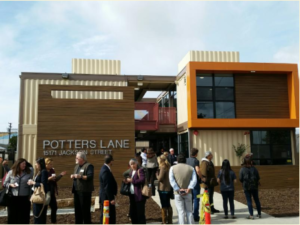 Potter's Lane, the first multi-family housing project for our homeless veterans ever built in the country, has opened in Midway City, CA., located in Orange County. American Family Housing, the organization behind this project, is dedicated to providing shelter and secure-living conditions for veterans and to create permanent affordable housing for these homeless veterans. At the ribbon-cutting ceremony on February 8th, Donna Gallup, the president and CEO of the organization, said that this complex is the first housing project to utilize recycled shipping containers. "We're always looking to give back to our communities," stated David House, president and CEO of Village Nurseries. "In this instance our donation is a double pleasure because we get to combine our loveof plants with the joy of helping our neighbors and contribute to a most worthy cause." To read more about the exceptional project, please visit: Potter's Lane.